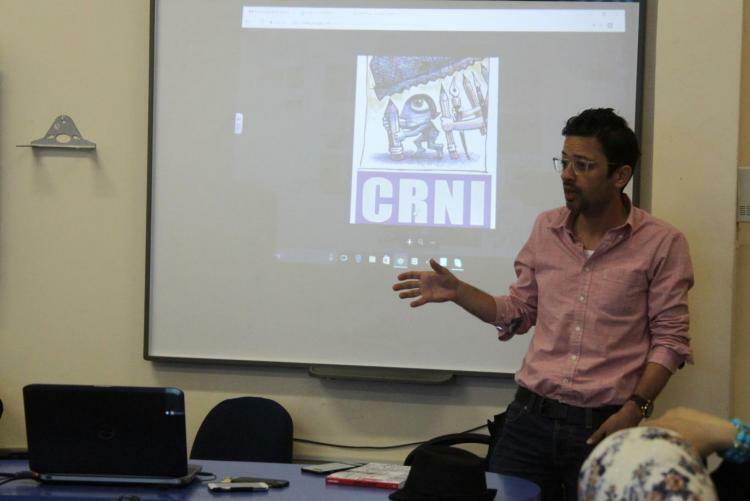 CRNI Executive Director Dr. Robert Russell speaks with our Regional Representative for Palestine, cartoonist Mohammad Saba’aneh following his recent detention by Israeli border guards and confiscation of artwork. Russell: To your knowledge are there other cartoonists in Palestine or Israel who are being harassed, questioned or worse from any of the major players in the conflict: PLO, Hamas, IDF et al? Saba’aneh: Yes, one of my friends, Osama Nazzal, was under investigation from the IDF because of his cartoons. Ismael Albazem, a cartoonist from Gaza was arrested by Hamas because he did a lot of cartoons criticizing Hamas movement. Actually, I am the only one who has faced pressures from all sides at the same time. R: What are the “red line” rules for a cartoonist working in Palestine right now? Have these red lines changed at all since President Trump named Jerusalem as the location for the new US embassy? S: There is no relation between Trump’s decision and the red lines in Palestine. Always our critical red line is the portrayal of religion and the sensitivities of any political party which has nominated that religion as a strategy and title for them, like Hamas and Al Jihad. I faced a big campaign against me, organised threats via mobile phone calls because I did a cartoon criticizing one of these parties. I think this political party converted its faithful into a tool of censorship under the name of religion. They became a “holy” political party and the people deal with them as if God’s Representative. R: Focusing on your case: do you think the authorities will return the tapestry cartoon that they seized from you last week? S: Certainly not. I think Israeli security understood the value of cartoons after Charlie Hebdo and how the world engages with and respects this art form. Israel started attacking cartoonists by many means; arresting them, investigating and accusing them of anti-semitism. That happened recently with a German cartoonist, not just Palestinian cartoonists. I am sure the Israeli security forces will take further action against me. I do not know what exactly, but they are escalating against me and the art of cartooning. The problem is I am the only cartoonist working in Israeli-controlled Palestinian territory. R: Would it help if we wrote a letter, admittedly I don’t know exactly where we would send it, encouraging the return of your property? S: I think if I scale up any protest and demand they give me the print back it will only encourage them to ban me from travel. I should be careful with them, this is not the first time they did some things against me but this time I chose to talk about it publicly. R: What are the media outlets in the Middle East/Palestine that you trust to tell the truth, or what might be closest to the truth on all sides? S: In terms of the Arab situation I do not trust many. Mostly I try to get my information and news from BBC and CNN. R: Are other artists, dramatists, singers, or any other kind of arts professional also getting criticism? Are any of them being threatened or are they under any danger? If so, who are they? S: In addition to Nazzal and Albazem… Graffitti artist Hamza Abu Ayyash because of an image on his Facebook page. Majida Shahen, cartoonist, she did a cartoon against Al Jihad Al Islami and they threatened her with death. R: Do you want to continue to run cartooning workshops? S: Yes sure, later in the summer I’ve arranged a short workshop for special needs kids under the name of CRNI. R: Thank you for your continuing dedication and courage, Mohammad.